The last Flying Training Day of 2017 for the Museum turned out to be something unique and special! The Harvard Club of SA was also accommodated to do their sorties interleaved with the Museum flying program. The Friends of the Museum operated their boerewors roll service and the Spitfire Restoration Project had memorabilia on sale and members on hand to share the enthusiasm for this ambitious project. The weather forecast had predicted 33% probability of light rain throughout the day and at 06:30 it started raining. 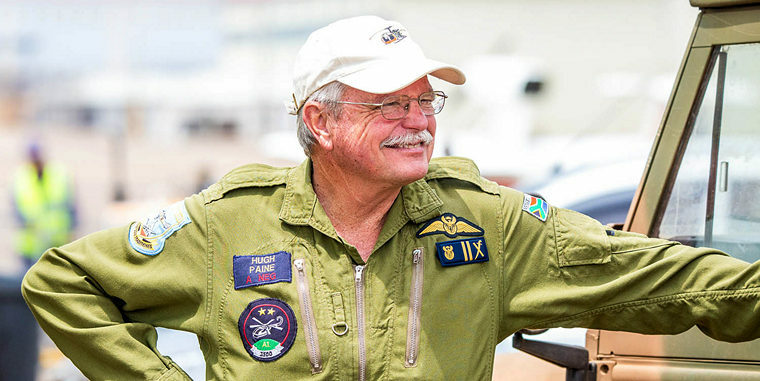 A quick communication with Lt Col Francois Hanekom (Yes, he is BACK!) confirmed that they were going ahead with the flying, with airliners at around 8000ft visible and cloud expected to clear from around 10:00. Conditions were overcast all morning, but cleared in the afternoon, with a few spots of rain now and again. Wind was Southerly making for the more spectator-friendly operation from the Northern end of the runway. Fourteen Museum aircraft were serviceable and all flew in various sorties on the day. This is a remarkable achievement from the small, but passionate and dedicated Museum technical team, who keep these “retired” aircraft in flying condition. Harvard #7480 has recently been re-sprayed and returned to service, and is looking like new again. Almost 80 year old aircraft still looking great and serviceable is something to see! Pilots of the Museum aircraft are both serving Air Force and Reserve Force members, many of whom trained on the Harvards, bring a massive amount of knowledge, skill and experience with them, not to mention their passion for aviation. Most of them are actively involved in the broader aviation industry. Interested younger Air Force members are encouraged to join in and formal arrangements are in process to see them flying the Museum aircraft in future as they are passed the “baton”. The flight line was full with the 14 serviceable aircraft and busy during the morning. The day started with the parachute drop from the Kudu, the cloud base being high enough for a normal exit. Training sorties with the Kudu, Puma, Alouettes, Bosbok, C185, Harvards, Patchen Explorer and Vampire were undertaken. The highlight of the day was two formations of very different aircraft performing a combined salute. Five of the Museum helicopters - the Puma, two Alouette II and two Alouette III formed the five-ship rotor-wing formation and then the WWII era Harvard trainer (The Pilot Maker) aircraft formed the four-ship fixed wing formation. Add two fire tenders facing each other about 15 metres apart just off the apron and the stage was set. Major General (retired) Hugh Paine has decided to retire from flying helicopters at the Museum after many years, apart from his prior active service, although he will still be supporting the Museum in various capacities and continue with his civilian helicopter flying activities. 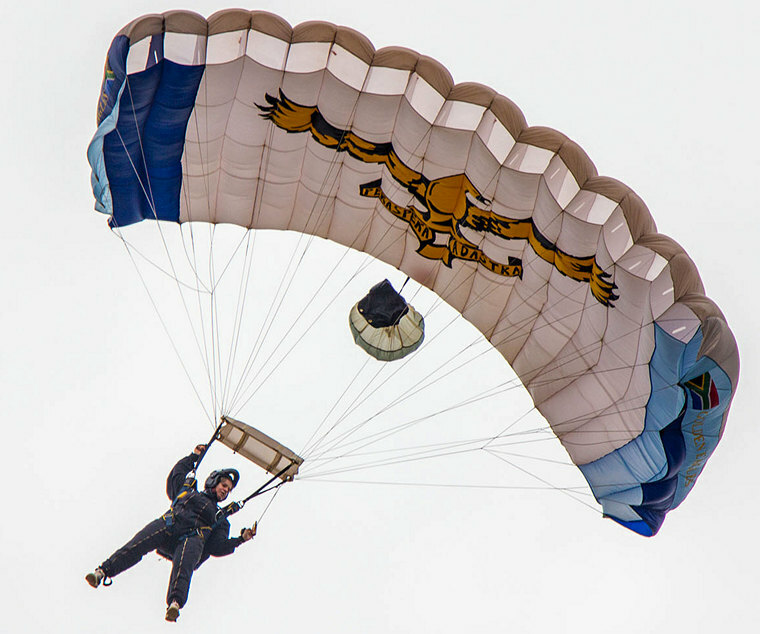 The General flew many types of aircraft including Harvards, Impalas, and many helicopters such as Alouettes, Pumas, MBB BK117s, Gazelles and others. He held various posts which covered amongst others, Officer Commanding 87 Helicopter Flying School, Chief Project Officer Rooivalk Helicopter Project, Chief Director Force Preparation, Director Air Capability Plan and Director Helicopter Systems. 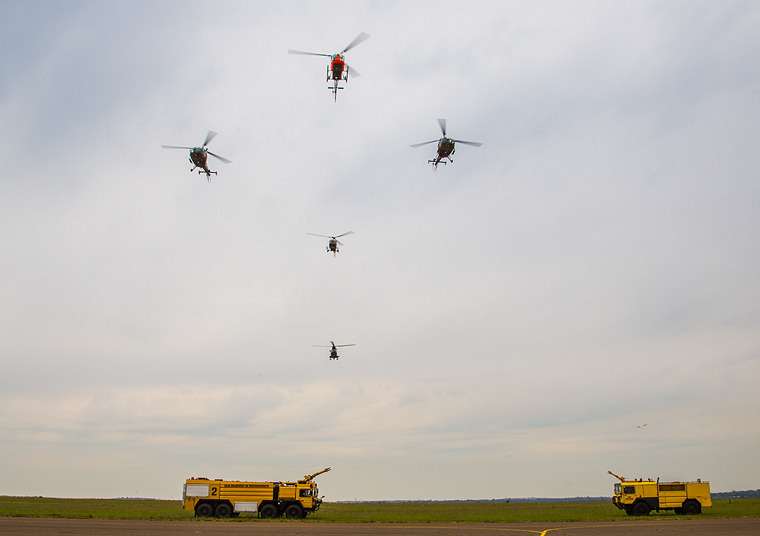 The five-ship rotor-wing formation approached from the East, with General Paine leading and landing on the hard-stand, while the remaining four choppers formed a diamond stack, hovering behind the fire tenders. 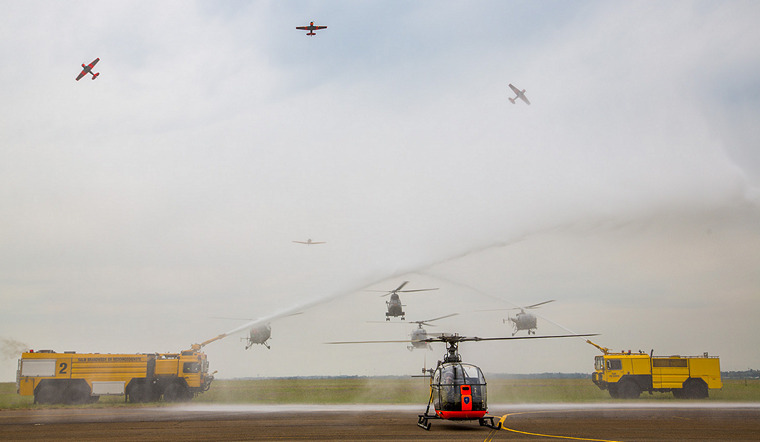 The four-ship Harvard formation, lead by Col Martin Louw also approached from the East and the fire tenders began their spray towards each other as the Harvards performed a break overhead in salute. The helicopters peeled away to the left and landed after which they did a synchronised shut down while the Harvards landed and formed up on the right and also performed their synchronised shutdown. Certainly the stuff of great memories and goosebumps! A small ceremony was held in front on Alouette II tail no.22, which had just been flown by General Paine, where the assembled air and ground crew were addressed by Lt Col Bruintjies (OC SAAF Museum) and General Des Barker. 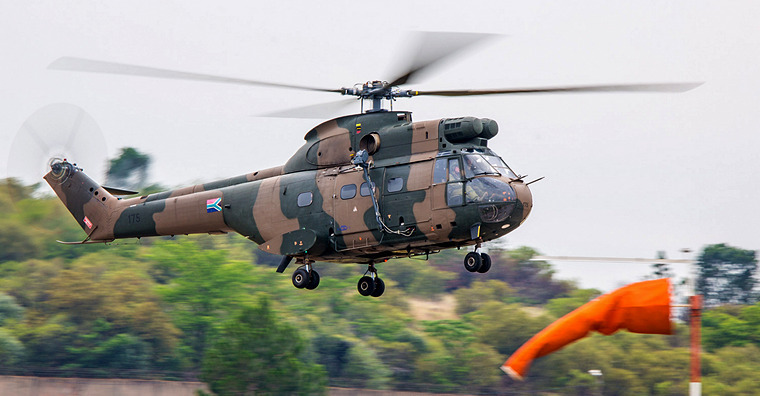 Lt Col Hanekom remarked that if the ages of the helicopters in the formation and their pilots were added, it would total in excess of 1200 years! The Harvards and their crews would have added significantly to the total as well! Those who came out to the Museum, despite what the weather looked like, were rewarded with something different! For the photographers, the cloudy weather is a challenge, but the softer light shows off the aircraft better.